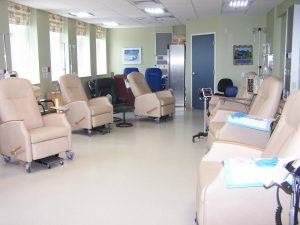 Chemotherapy is medicine used to treat cancer. Cancer drugs work in different ways to destroy cancer cells, stop them from spreading or slow down their growth. Other medicines used to treat cancer include hormones, biologics or targeted therapies. The type of treatment may be different for individual patients. Your health-care team will discuss your treatment plan with you in detail. Chemotherapy is delivered in many health-care sites throughout Newfoundland and Labrador (see map to the left). 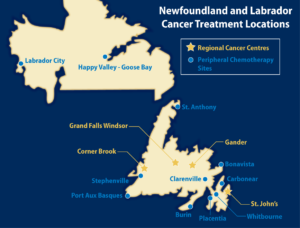 If you need to travel for chemotherapy treatment or need help finding a place to stay, cancer patient navigators and social workers may be able to help. Your family physician is a very important member of the cancer care team and will receive ongoing information from the oncologist regarding your care. It is important you have regular visits with your family physician while receiving cancer treatment. Supportive care services are also provided by social work counsellors, dietitians and pastoral care. Remember that you are the most important member of your health-care team and you should ask any questions that you have about your treatment. 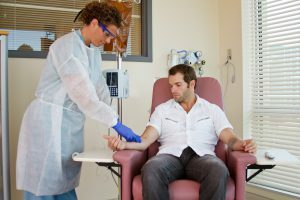 Who is involved in planning your chemotherapy treatment? Your oncologist will talk to you about a plan of care and outline next steps. The oncologist works closely with nursing and pharmacy in planning your care. If possible, they will arrange for you to receive your treatment as close to home as possible at a treatment site in your area. skin (topically) – a cream that are rubbed on your skin. To learn more about the common side effects of chemotherapy, please read, ‘Side effects of chemotherapy’ by the Canadian Cancer Society.